Different folks seek out enhanced air filtration systems for different reasons. For example, you may be suffering back-to-back bouts of seasonal allergies (did you know Canada has four different allergy seasons?) and you need to feel better fast. Or perhaps someone in your family suffers from asthma and they need the help air filtration can provide to ease symptoms. Maybe you are concerned about off-gassing and combustion by-products from cooking, tobacco use, running your fireplace or furnace and other causes. Whatever your purpose in shopping for an air filtration system for your home, these tips will help you make a smart purchase that meets your needs! These two terms sound similar and are frequently used interchangeably. But they don’t mean the same thing and they don’t do the same thing. An air filtration system uses special filters to trap airborne toxins so they cannot pass through into your home or workplace air supply. The best filters can trap particulate matter as tiny as 1/100th of a single human hair! There are different types of filters and some are better at trapping certain toxins than others. An air purification system, on the other hand, uses ultraviolet light technology (and specifically the most powerful UV light band—UV-C) to change the structure of airborne toxins so they cannot harm you. Basically, a purifier zaps the toxin with UV-C light to neutralize any negative impact. Both of these types of air cleaners are great, but you don’t want to inadvertently purchase one when you are intending to buy the other! Even if you are just now beginning to learn about air filters, you have probably heard the acronym “HEPA.” This stands for high efficiency particulate air and it is a technology that was first developed during World War II. Today, HEPA is still a leading choice for the toughest air filtration jobs, including many hospitals and laboratories where air cleanliness can be a matter of life or death. Other air filtration systems include carbon, ionization, ozone and specialized media furnace filters with high ratings (MERV 11 to 20). So let’s take a closer look at each one of these options and their pros and cons. The HEPA filter is the one you want if your goal is to end up with squeaky-clean indoor air. However, there is a catch to be aware of. Standalone HEPA filters (or furnace filters MERV-rated at HEPA levels) typically do not work well with most consumer-grade air conditioning systems. The HEPA filter is incredibly dense. The denseness is what makes it so good at capturing even the tiniest airborne toxins. But the impact on your A/C unit is similar to the effect of you running straight up the side of a hill. After a few minutes, you are huffing and puffing and still can’t seem to catch your breath. For this reason, most HEPA filters are sold a bit differently than your traditional furnace filter. They can be purchased as portable standalone units or central (whole home) units. These units easily retrofit to work with any HVAC system without burdening your furnace or air conditioner with the extra task of pushing air through such a dense filter. Activated carbon filters (charcoal filters) are designed to do some heavy lifting in a different air quality arena—trapping and neutralizing toxic airborne gaseous molecules by trapping them and removing them from your indoor air supply. This can be great to remove strong odours as well as gaseous toxins. It is important to know that while activated carbon filters are amazing at what they do, they can’t trap solid particulates like dust or pollen. They work only on gas molecules. Activated carbon, or charcoal, is made up of porous bits of partially burned organic matter including wood, coal or coconut husks. These bits are “activated” to create their surface area (the area available to trap gaseous toxins). When all the surface area is filled with toxins, you will need to change the filter. Ion filters are also called electrostatic filters and ozone filters. Because these filters are actually filterless—instead, they use charged plates—they can be a good option for spaces where there isn’t any way to install a high-level filter to clean the air. However, we don’t recommend ion filters because they can off-gas ozone. Ozone is protective and wonderful when it is high up in Earth’s atmosphere protecting us from harmful ultraviolet radiation. But down here on the ground, ozone can cause harm when we breathe it in. There are many different kinds of media filters of varying density and thickness. These filters are sometimes called “low pressure drop” filters because they don’t place the same burden on your HVAC system that a thick, dense HEPA filter can cause. The typical specialized media filter comes in its own sturdy case and is retrofitted to work with your HVAC system. Installation ensures the filter won’t move about, so all the air will move through the filter before passing out into your ducts. 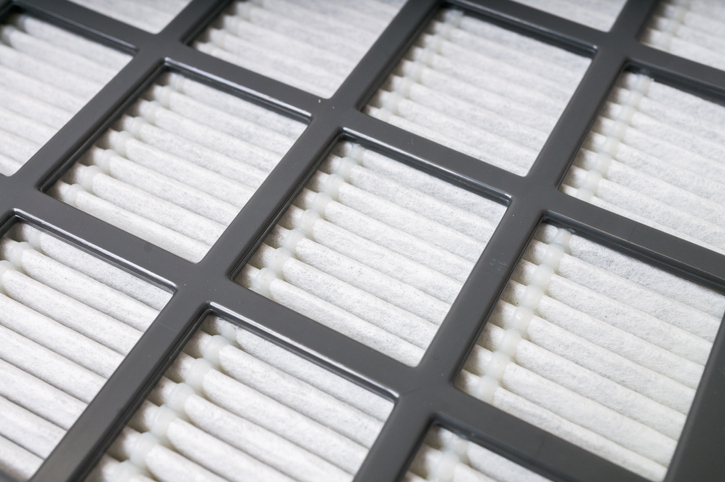 These filters have a longer lifespan than your typical furnace filter. Some last up to three months and some need changing only once a year. Do You Need Help Choosing an Air Filtration System? We proudly carry the Amaircare brand of HEPA air filtration systems. These wonderful systems are compact and sturdy, and come outfitted with both a HEPA-grade air filter AND a carbon filter, along with a pre-filter for maximum air scrubbing ability. Our HEPA line can be retrofitted to work with any existing HVAC system to remove solid and gaseous toxins from your indoor air supply.